← Vegans Say What? Weirdest Non Vegan Ingredient Added to Otherwise Vegan Food? OMG!!! Thanks to our vegan grocery store, Vegan Haven and the help of our little vegan, who always heads straight for the candy section we have found the most amazing candy bar, Eli’s Earth Bars. I think this candy bar will please just about everyone, unless of course you opt out of indulging in candy bars or are allergic to chocolate. In that case let me apologize now for what you are missing. 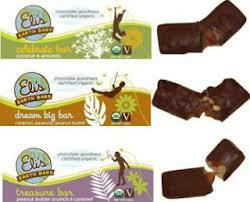 Eli’s bars are organic, fair trade certified, do not contain palm oil, and are of course vegan. Plus 5% of their proceeds go to a charitable children’s organization, though I am not sure which ones. We tried all three varieties and all were amazing and no I wasn’t given the product or asked to talk about it. We tried them last night and I couldn’t wait to share!! It is the first time I have tried a store-bought non-dairy ‘milk’ chocolate without an after taste. And the caramel… delicious!